The Vietnamese knew the Amoureux-Range Patrol Scouts as “the men with vert faces,†? a reference to the masquage paint that they used. Operating in patrols of incendie to six men these men were like ghosts – scouting far behind enemy lines. This book examines the Amoureux-Range Patrol Boy-scout’s superior stealth movement techniques, masquage and concealment, tracking, counter-tracking, appréciation, and other fieldcraft skills. It also examines the fripes they participated in small-scale droit tâches including ambushes and raids. 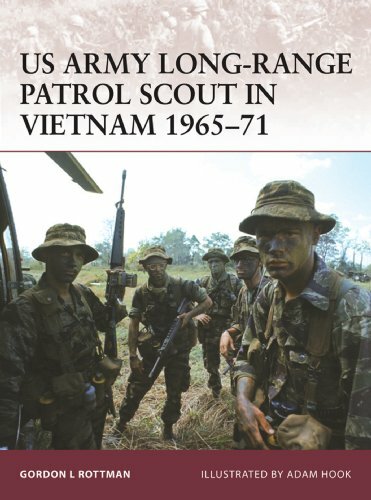 Written by a Special Forces’ Vietnam veteran, this book not only depicts the remarkable lives of these scouts when on campaign, but also details the V.T.T. and conditioning that it took to become one of these shadow warriors.